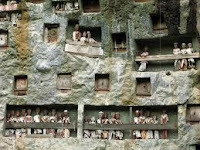 An exotic place of burial, a cemetery where bodies are stored in holes carved on rock wall. This place is a man-made from exceptional Toraja. Funeral that has been around since the 16th century was made by carving using very simple equipment. There are 75 holes in the wall rock. Some of them have statues lined the so-called tau-tau. The statues are a symbol of social position, status, and their role during the life of the local nobility. Located about 12 kilometers south of Rantepao or six kilometers north of Makale, this object is visited since 1960. Besides watching the stone tomb, tourists can also buy various souvenirs or walking path around the object witnessed pangi the ripe fruit and browning. The fruits were ready to be processed and eaten as a food typical Toraja tribe called pantollo pamarrasan.